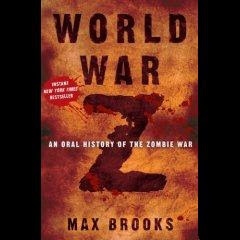 World War Z, a zombie novel by Max Brooks. I finished reading this about two weeks ago--read it in about two days. Very good book--great book for what you'd expect from a book about the "zombie war". The author writes from the view point of a reporter, interviewing survivors of the Zombie War. His subjects include people from all walks of life--each with a different, unique, and very creative story to tell. The execution is smart, sharp, and very well done. Brooks approaches his subject--zombie survival--realistically and seriously. And it works. Set in the near future, the zombie plague begins in remote villages of China--it spreads quickly, but the Chinese government does their best to put a lid on its existence. Refugees flee from the growing hordes of undead, seeking medical attention for their ill family and friends. The zombie infection spreads quickly, engulfing the world in a pandemic of the living dead. Brooks writes his interviews of people from all over the world--a rogue chinese sub commander, Japanese hacker, U.S. army grunt, the vice president, a Russian priest, the list goes on and on. The creativity of the book is what really stood out to me. Brooks clearly spent weeks thinking "What if..." and considering what could happen in a world-wide zombie outbreak. The war against the zombies is truly a world-wide war, stretching to every corner of the globe, and Brooks considers dozens of different angles and scenarios. The book is not a "perfect" read by any means; some of the survivor's stories are more interesting than others. Some of Brook's ideas are riveting and unique, while others may seem implausible and fall flat. World War Z throws lots of fun, creative ideas and stories at the reader, but does not take the time to fully explore any of them. There are several really great novels that could be written here...maybe Brooks will fully flesh out some of these tales at a later date. As the book jumps around from interview to interview, it can be hard to form any kind of attachment with the characters, and even some confusion about who is being interviewed. I think a second read could be beneficial here. Nit Picks: As with a lot of zombie fiction, there is a healthy dose of violence, gore, and vulgarity (if you mind those things). For those who are into guns, World War Z may leave you a little wanting--many of the weapons are fictional, post-zombie outbreak creations. All in all, as far as zombie books go, World War Z is very smart, interesting, and creatively done. It exceeds expectations and sets the imagination running.